Manta Ray 290 - Tobacco Burst Flame Maple, Hollow Body/Semi Hollow Body Electric Guitar from Reverend belonging to the Manta Ray 290 model. Reverend keeps introduces a new evolution of its Manta Ray 290 guitar series, which now features a Plain Top version. Along with a plain maple top, new features include block inlays, neck binding, and Reverend Pin-Lock tuners. According to Reverend, the Manta Ray 290 sounds warm and sweet while producing the acoustic richness and complex overtones of a classic full size semi-hollow -- all in a slimmer, smaller body. 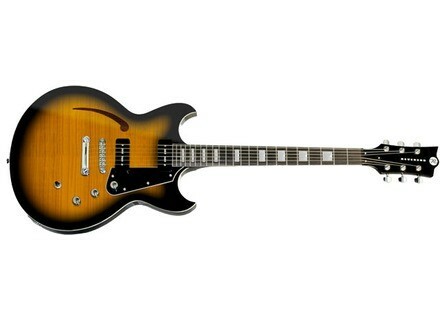 The bridge pickup is slightly hotter than a classic vintage P-90, and the neck pickup slightly cleaner. Solid wood construction is featured throughout, with no veneer or plywood. The back, sides and center block are produced from one slab of korina which is routed from the top, and then capped with a solid maple top. Sustain and attack are enhanced, and coupled with substantial resonance for a lively and responsive tone. Peavey PXD Series guitars now available Peavey starts shipping the PXD Series, a new series of electric guitars which distinctive look clearly should appeal to metal guitarists. Rees presents the Rambler Travel Guitar Rees presents the Rambler travel guitar. Luna ignites Apollo's launching Luna Guitars has launched the apollo, an electric guitar named after the... Greek and Roman god of light, truth, medicine and music (...what else? ).